Portobello Road, its market and a long stretch of land crossing Ladbroke Grove and Acklam Road has become the subject of much debate as a result of plans for changes to the area published by the Westway Trust. The Westway Trust became responsible for a mile / 23 acres of land under the Westway when the dual carriageway was opened in 1970. The Trust’s remit is to ensure the land is used for the benefit of the local community as compensation for the concrete eye sore that dominates and darkens the areas underneath it. Of the area under scrutiny, the Westway Trust says: “The markets only operate for three days a week and, outside of those days, areas like the canopy space and Acklam Village do little to contribute to the local area. Acklam Village is hoarded-off and is not accessible to the community from Monday to Friday”. This is the economic thrust of the Trust’s argument for change, but they are insistent that any changes will not overturn the unique character of the area. Their plans are called ‘Destination Westway’ and include a major proposal for the ‘Portobello village’ – on Portobello Road, where it meets Cambridge Gardens. But, there is significant opposition to what the Westway Trust has so far proposed. The founder of a 38 Degrees petition against the plans, Chris Sullivan, says that the “last esoteric, bohemian part of West London” is under threat. With creeping gentrification in the area, the Westway Trust’s plans may be a step too far, and community with a very clear sense of self is reacting. 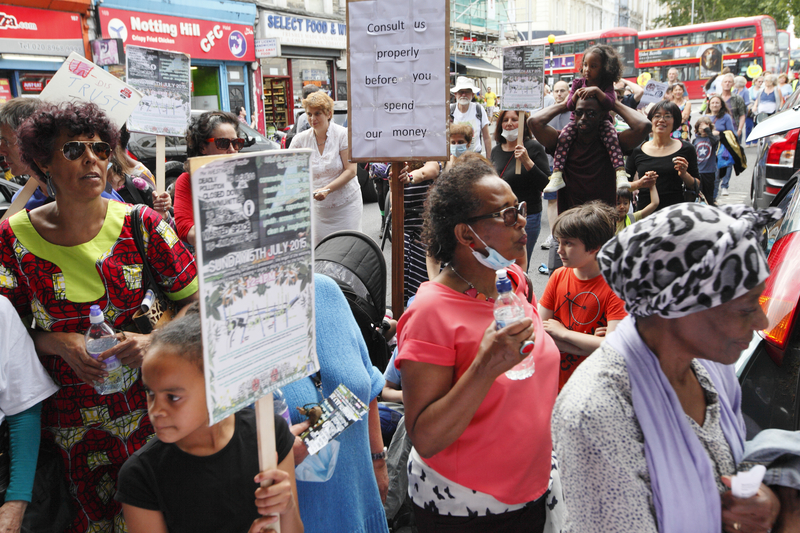 The organisation Westway23 has called for a new consultation process, complaining that the “plans have been developed without proper consultation with the local community and threaten to add to the already negative effects of gentrification on the local area”. As a result of the community’s reaction, the Westway Trust’s plans are now on hold and an apology appears on their website for the fact that the images of people in their designs didn’t represent the community (they were all white.) They are also at pains to stress that the designs were not intended to be final. But, despite their attempts at assuaging the community, other recent developments in the area mean that the Westway Trust aren’t taken at their word. The Westway riding stables have effectively been given their marching orders by the Trust who refused to pay for the required improvements. And Maxilla Children’s Centre / Nursery has been closed, its services picked up elsewhere in North Kensington. Westway Trust have been blamed by some for the Maxilla closure, but this seems to have been more the decision of the council who were unwilling to provide assurances about funding despite earlier informal agreements. A recent release of funds for a community grants programme has been viewed by a number of people I spoke with locally as Westway Trust’s attempt to improve their public image. The same people were critical of how difficult it is becoming to work with what they see as an increasingly corporate organisation. “I challenged the illustration (the initial artist’s impression drawn up by architects Stiff + Trevillion) – they hadn’t included any black people so I offered to facilitate a genuine community meeting. They didn’t get back to me within two weeks, which was the time scale I’d set, so when I contacted Westway Trust again, I was introducing them to Westway23”. Sylvia Parnell, of the Portobello Café Society, one of many people who stopped to greet Niles as we talked, told me “the Westway Trust wouldn’t let us see the minutes of their meeting about the proposed changes so Niles took the lead, as he was already engaged with the Trust on issues of concern”. On the Westway Trust, Hailstones is critical of their actions and their approach to the local community: “They always feel that they know what’s best for us because they’re in a vacuum. On the one hand they can be seen as having a colonial perception – that’s unavoidable if you look at the history of slave ownership which has deep roots in Kensington and Chelsea. And on the other hand, the public are accustomed to a system of servitude, where they play a secondary role in the conversation”. A substantive take on gentrification is at the heart of Westway23’s approach, along with an instinctive urge to protect the local area. Niles continued: “What we’re seeing here is a super imposition of a culture and perception from outside imposed by people from outside the area…like this idea of a ‘village.’ The Westway Trust held their community festival right next to the area they aren’t representing. This is hypocrisy, this is ironic”. “The biggest component of this has been irony. They are supposed to represent the community, but these changes were all decided without our knowledge”.